what i thought was a transmission fluid leak for the past several months -- that can wait, right? -- was actually a fuel leak. so, while my mechanic was replacing the batteries, he found the fuel leak. right next to something with a big name that shoots sparks. he tells me it's a miracle that the engine hasn't caught on fire. so, after all of this time cursing the fate of having to replace my batteries, it looks like my hefty guardian angel was really looking out for me. so then i had to pay to replace this fuel line thingie. also not fun. but again, the saints were smiling, as my mechanic offered to replace the fuel thingie for cost. no labor. have you ever had a mechanic offer to take off over $150 worth of labor (i know this because i peeked at the invoice before they revised it -- they never would have told me how much it was, they aren't like that) out of the kindness of their heart? so, thanks, barnabas. you rock! 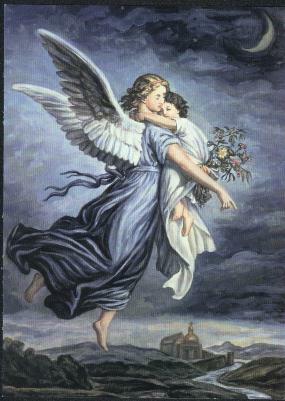 Angel of God, my guardian dear, To whom God's love committs me here, Ever this day be at my side, To light, to guard, to rule, and guide. From sinful stain Oh keep me free, And in each hour my helper be. Thank you Barnabas. Thank you very, very, very much! seriously, who is this mechanic?! hope this week is much less eventful for you, smock. speedee lube on south cooper. the owners are matt and delena kirby. they totally rock! This page contains a single entry by smockmomma published on July 26, 2009 12:12 AM. Agnes is the next entry in this blog.